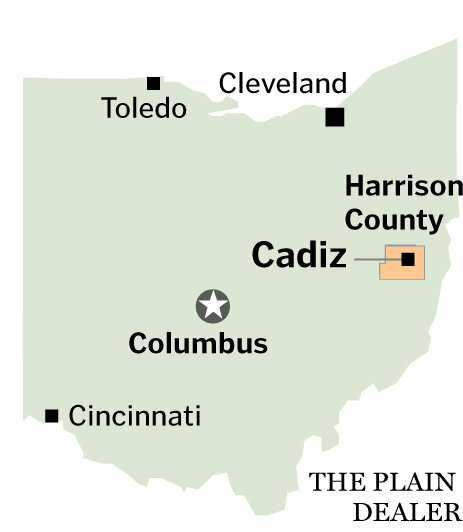 CADIZ, Ohio -- Sparsely populated Harrison County, in the rolling foothills of the Appalachians, boasts a rich vein of U.S. history. The county was a hotbed of abolitionist activity in the years leading up the Civil War. It's where General George Armstrong Custer and Edwin Stanton, President Lincoln's secretary of war, were born. And on Charleston Street, in the county seat of Cadiz, is a two-story, white frame house that is the birthplace of actor Clark Gable. In recent years though, Harrison County has been out of the spotlight, but a judge's ruling could change that. Harrison County Common Pleas Judge Michael Nunner has sharply limited Chesapeake Exploration's ability to drill for shale gas and oil from a property where the company has leased the mineral rights. The ruling is rattling an industry that Cleveland State University economists predict could pump $5 billion a year into the state's economy by 2014. "It could affect Chesapeake and other drill companies across Ohio," said David Hudson, who represents the Jewett Sportsmen and Farmers Club, the landowner that sued Chesapeake. Nunner said while Chesapeake can vertically extract gas and oil from underneath the hunt club's 187 acres of woods and fields, the energy company can't use the land to drill sideways to get at reserves from adjacent land. He ordered Chesapeake, a dominant player in Ohio's shale production, to stop horizontal drilling that extends beyond Jewett's property line unless it gets the club's permission to go ahead. Extracting natural gas and oil from shale formations depends on lateral drilling to carry millions of gallons of water under intense pressure to fracture surrounding rock. Horizontal bores can extend up to 10,000 feet, or almost two miles, from the drill hole. Chesapeake already had created a 12-acre pad for rigs but has sunk no wells. "They don't have a right to come in and destroy our surface without fair compensation," said Jewett club president John Harris. A spokesman for the Oklahoma-based Chesapeake declined comment. So did North American Coal Co., which owns the mineral rights and leased them to Chesapeake. The coal company, in a motion earlier this month, asked Nunner to reconsider his order that effectively halted Chesapeake's ability to profitably plumb the shale rock some 8,000 feet below ground. North American Coal, in its motion, said that the order directly conflicts with Ohio public policy to encourage development of natural resources "by halting any oil and gas production through the use of contemporary horizontal drilling methods on this property." By creating an "erroneous new law, it would impede or prevent the development of oil and gas elsewhere in Ohio, with significant adverse effects for the state's economy," the company said. Harris said the club's 190 members are about evenly divided between those looking for a good settlement from Chesapeake in exchange for their approval on drilling and those wanting the company to go away. The club, in the center of Harrison County, about seven miles north of Cadiz, dates back to 1959 when its 12 founders took out a bank loan to buy a chunk of land they were leasing to hunt white-tailed deer, jackrabbits and wild turkey. "It makes us a unique piece of property because there's no houses around," Harris said. "We're sitting right there in the middle of nowhere." Members today raise money by renting out a lodge for wedding and graduation parties, throwing annual corn roasts and raffling off all-terrain four-wheelers. They spend about $1,000 a year stocking three lakes at the club with bass, blue gills and crappies. After Nunner blocked horizontal drilling, Chesapeake approached Harris about starting from square one and working out a deal. "We sent our (monetary) demands and have not heard another word since," Harris said. He would not elaborate on the proposed settlement. North American Coal deeded the land to the club in 1959, said Gregory Brunton, a lawyer for the Cleveland-based Reminger law firm that represents the club. Coal companies across eastern Ohio often sold off surface real estate when they were done mining. But those companies held on to the underground mineral rights in case they wanted to go back in and take out more coal, or oil and gas. Ohio law says owners of such "severed" mineral interests have a right to "reasonable" use of the surface to get at the minerals. Brunton said the club's deed didn't anticipate shale gas extraction -- which requires not only long horizontal wells, but also large well pads with multiple wellheads on each, storage tanks on site, and convoys of trucks hauling in millions of gallons of water. The Jewett lawsuit is one of the latest legal fights shaping up over shale gas drilling in Ohio. In a separate lawsuit filed this month, 33 landowners in Columbiana County contend that land men concealed or actively misled them about how much surface and below-ground disruption was involved in shale gas extraction. And in Akron,Chesapeake sued 95 landowners in January for attempting to get out of their leases and sell them to another bidder. In this latest case, Reminger attorneys representing the sportsmen's club have been fielding calls from other lawyers who wonder about the impact of the Harrison County case on the landowners they represent. If Jewett Sportsmen and Farmers Club and Chesapeake can't settle their dispute, the case is expected to go to trial on the club's claim that Chesapeake trespassed on its property. "It may have potentially wide ramifications," said Brunton, who considers the case precedent-setting in Ohio.